St. Louis, MO– The St. Louis Rams had a home game against the Oakland Raiders this Sunday, but they had other things on their mind besides football. Ferguson, MO is a St. Louis suburb not far from where the Rams play at Edward Jones Dome. Ferguson is where Mike Brown, an unarmed black teen, was shot and killed following an apparent altercation with white police officer Darren Wilson. The community and the country felt division and racial tension return to the front lines in a way nobody was hoping it would–the death of a teen bound for college that was going to start not long after the day he passed away. Of course the decision of a Grand Jury to not indict Officer Wilson on any charges shocked most of us. While the Grand Jury claimed to have analyzed every eyewitness account and piece of evidence, there are disputes among the black community and other circles that that may not be the full truth. And as much as it hurts to say people took sides they did just that…they took sides strongly. 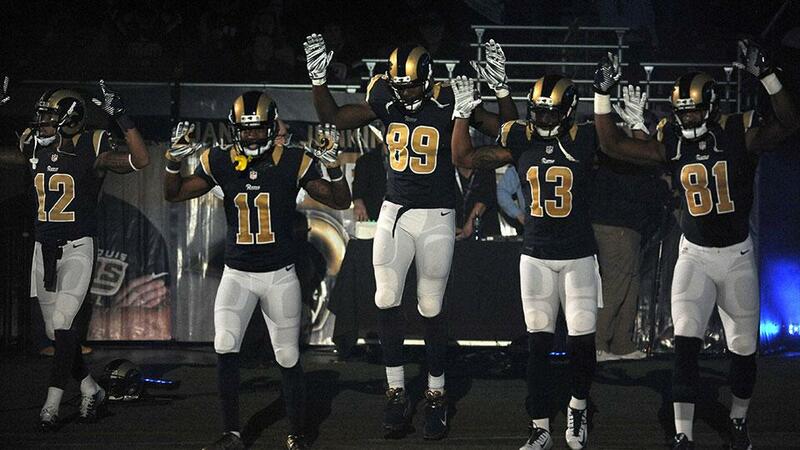 Rams players (from left to right) Stedman Bailey (12), Tavon Austin (11), Jared Cook (89), Chris Givens (13), & Kenny Brit (81) are those with their hands up in the above picture. While it is great that they are making a stand for how they feel about an incident that has garnered tons of mainstream media attention, I don’t know if that sent the right message by doing so in the NFL. There are awareness campaigns for things like cancer and other serious diseases that permanently detriment and alter peoples’ lives on a massive scale, but those are never political play or such a double-sided issue. Problematic at best, what the five Rams players decided to do should have been kept off the field but still allowed to happen. If they feel so inclined to rally together with those on the street then so be it, but on a national stage over a case that was settled via forensics and critical analysis by experts, I felt it was strongly inappropriate–especially having this happen so close to ground zero, where the shooting took place. I understand that there is great frustration and hurt in the hearts and minds of many people who feel mistreated by the system we have in place in America, but there are ways to evaluate evidence and make a decision about whether or not to move forward with charges. The Grand Jury’s job is to do just that, but their job, I’m sure, never mentioned in the job description that they would have to choose between unrest or unreliable evidence. Claims of people being wrongfully violated, stereotyped, or categorized and then going on to burn down their entire town do not exactly speak volumes about quality character. In fact, it does just the opposite. The problem is not making your voice heard, you have that right as an American, but knowing how to and when to make your voice heard needs to be taken into consideration.